Abruzzo is one of Italy's little-known treasures: a tranquil mingling of mountains and coastline, it is sparsely populated and rarely visited by tourists. Home to one of Italy's highest peaks (the Gran Sasso, at an altitude of over 9,500 feet) and a busy port (Pescara, the most populous city in the region), it boasts a rich repertoire of robust mountain dishes and an abundance of seafood specialties. The regional capital is L'Aquila, a charming city with a view of the Gran Sasso that was founded by Frederick II of Swabia in 1254; today, L'Aquila is home to 70,000 people. 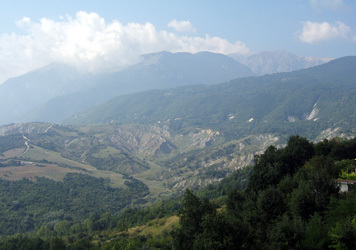 Near L'Aquila is the Parco Nazionale dell'Abruzzo, an enormous natural reserve (about 200 square miles) where hundreds of rare animal species roam free. 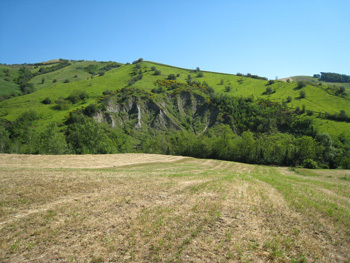 Other important Abruzzese cities are Teramo (whose first-century A.D. Roman theater is still used to host shows), Chieti (an ancient Roman settlement), and, from a culinary standpoint, the village of Villa Santa Maria (where some of Italy's finest chefs honed the art of Italian cuisine). In some ways, Abruzzese cuisine is the undiscovered treasure of Italian gastronomy. While tourists rhapsodize over Tuscan cuisine and Italians wax poetic over Emilian cuisine, few have truly delved into the flavors of Abruzzo's kitchen. Abruzzese cooks are masters at turning simple ingredients (perhaps a handful of freshly plucked beans from the garden plot, gleaming black mussels, golden noodles) into glorious feasts. They flavor their dishes with hot chili pepper, aromatic saffron, fruity olive oil. 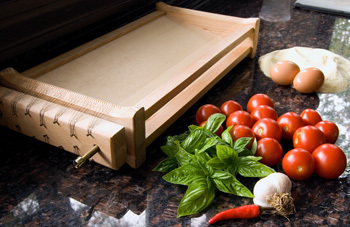 Pasta is the preferred Abruzzese first course, and none is as typical as maccheroni alla chitarra ("guitar pasta"): sheets of egg dough are cut using a flat rolling pin on a wooden box with strings (hence the name "guitar"). 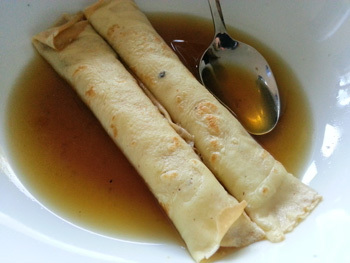 Crêpes (called scrippelle) are rolled around savory fillings, dropped into broths, or layered with cheese, vegetables, and meat before baking. Polenta is usually enjoyed with a spicy sausage ragù or hearty meat sauce. In port cities, just-caught fish is marinated in a vinegary brine, and rich soups are concocted from dozens of types of fish. In the mountains, sheepherding remains a common way to make a living, so lamb, kid, sheep, and mountain goat are mainstays of the diet; wine, garlic, olive oil, and rosemary are favorite flavorings, especially when the source of heat is a lively wood fire. Many families still raise their own pigs, and free-roaming pigs yield flavorful, lean meat and tasty salumi (cured meats). Pastries tend to be unsophisticated: olive oil is often used instead of butter, nuts or dried fruit provide bulk and flavor, and sheep's milk ricotta, a favorite in central and southern Italy, shows up in fritters and sweet cakes. The most interesting Abruzzese culinary tradition is la panarda, a multi-course feast of gargantuan proportions. A legend holds that la panarda was born when a young mother, gone to fetch water near her home, returned to find her newborn in the mouth of a wolf. Desperate, the woman prayed to Saint Anthony of Abate, and the wolf let the baby go. The grateful young mother promised to prepare a feast for Saint Anthony, starting a tradition that would be passed down from generation to generation for centuries to come. Most panarde consist of 35 to 50 courses and last all night, thus enabling guests to partake of every dish at a leisurely pace. The mountain town of Villavallelonga has preserved its panarda traditions more fervently than others, and local families still host the feast on an annual basis. To go to Villavallelonga, take Highway 25 to the Celano exit, then follow the road to Trasacco and look for Villavallelonga. 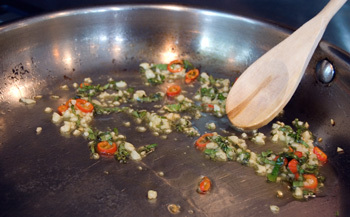 Make the sauce: Place the olive oil, garlic, basil, and chili in a wide skillet. Turn on the flame and allow the aromatic ingredients to warm gently for about 1 minute. It is essential that they release their aroma into the olive oil without burning. This is best achieved by starting the aromatics in cold oil and warming the oil along with the aromatics, rather than adding the aromatics to hot oil as most recipes indicate. 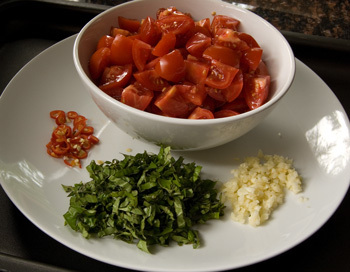 Using a wooden spoon, stir well and add the tomatoes to the skillet. Season the tomatoes with the salt and pepper. 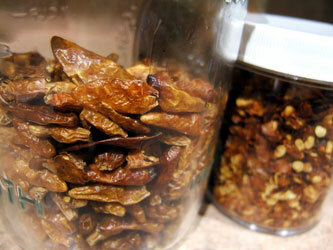 Bring to a gentle boil over a medium-high flame, then cover with a tight-fitting lid. Cook without uncovering the skillet for about 5 minutes, shaking the skillet every minute or so. The tomatoes will break down into a nice, chunky sauce. 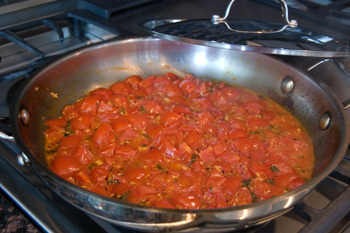 Once the liquid surrounding the tomatoes takes on a warm orange hue, the sauce is ready and the flame should be turned off. This sauce tastes best if cooked quickly, not simmered a long time. The raw ingredients for homemade maccheroni alla chitarra are simple: just semolina flour and eggs. The standard formula used by most Abruzzese cooks is 3 and 1/2 ounces of semolina flour in all per egg. If you like your pasta less rich, you can replace 1 of the eggs with tepid water. 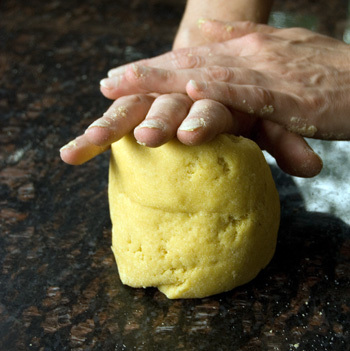 Make the dough: Place the semolina flour on a counter. 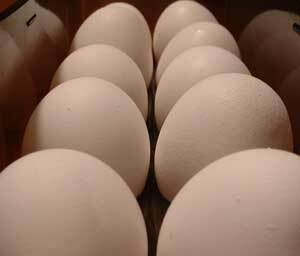 Make a well in the center and crack the eggs right into the well. 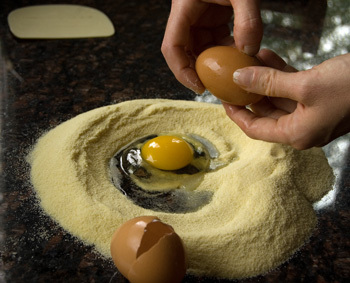 Alternately, place the semolina flour in a bowl, make a well in the center, and add the eggs to the well. Work the eggs into the flour in the bowl, then turn the resulting dough out onto the counter and knead it as above; this method may be easier for beginners. Use all the strength you have in your hands; this is a rather firm dough, nothing like bread dough; it is quite dry, and needs to be pushed, compressed, turned so that the flour absorbs the eggs and the resulting dough becomes smooth and supple. Now it is time to let the dough rest about 30 minutes so the gluten relaxes and the dough is easier to roll out. Cover the dough with plastic wrap or with a clean, dry towel, and let it sit at room temperature for 30 minutes. 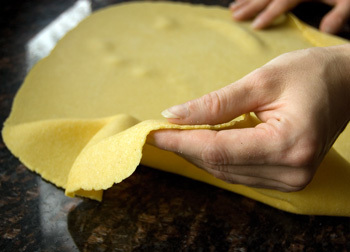 Once the dough has rested, lightly sprinkle a counter with semolina flour and start rolling the dough out into a thin rectangle with a rolling pin. If you have a long wooden dowel, or thin, tapering rolling pin, this will be easier. But even a regular rolling pin works. Try to keep the dough rectangular as you roll it out. The length should be slightly shorter than the stringed portion of the guitar. The total thickness should be about 1/4 of an inch. 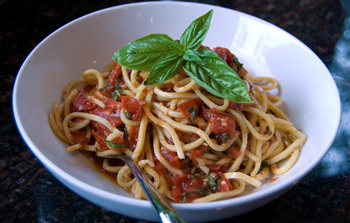 In essence, maccheroni alla chitarra are square spaghetti; so they should be as thick as the strings are wide. Since most guitars have 2 settings, select the setting you prefer and roll out the dough into a rectangle of that thickness. Cut the dough with a pastry wheel into rectangles similar to the stringed portion of the guitar. It is much easier for the guitar to cut the dough into strands when the dough has had a chance to dry out a bit at room temperature. The metal of the guitar cuts better through a slightly dry dough than through a dough that is still rather moist. So let the dough rectangles sit about 15 minutes before cutting on the guitar. One by one, place the dough rectangles on the stringed portion of the guitar. 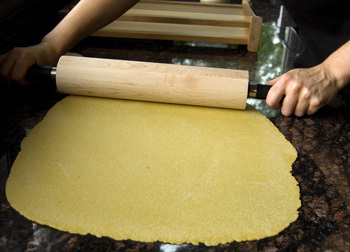 Place the rolling pin on the bottom-most portion of dough and roll with all your strength up, towards the top. The dough should cut into nice, even strands. Ideally, you will only need to roll upwards once if the guitar strings are really sharp. If the strings do not cut the pasta well, it may be that they need tightening, or that you need to apply more strength on the rolling pin as you roll. When the pasta is cut, it will look like square spaghetti. Toss with semolina flour and place on a semolina-dusted tray, separating the strands so they do not stick together. The pasta can be held at room temperature for a few hours or refrigerated for up to 24 hours, as long as you make sure to toss it with semolina flour once in a while to prevent sticking. To cook the pasta: Bring 4 quarts of water to a rolling boil and add the salt. Add the pasta and stir well to separate the strands. Cook about 3 minutes, or until al dente. This is a thick, toothsome pasta, so it will take longer than most fresh pastas to cook through. In fact, when rolled to the same thickness, all semolina flour pastas take longer to cook though than pastas made with all-purpose flour. Drain the pasta, reserving 1/2 cup of the pasta cooking water. Toss the pasta with the warm tomato sauce, the olive oil, and the reserved pasta cooking water as needed to dilute to a coating consistency. You may not need all of the reserved pasta cooking water. An Abruzzese specialty known as Scrippelle Imbusse, this simple yet delicious first course is especially suited to cold autumn nights when something comforting is called for. The crêpes can be cooked, stuffed and rolled 12 hours ahead and held at room temperature, covered with plastic wrap. Using a whisk, beat the eggs and flour in a bowl. Whisk in the milk; pass through a sieve into a clean bowl. 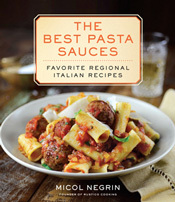 Whisk in 2 tablespoons of the Parmigiano, 1/4 teaspoon of the salt, the parsley and the nutmeg. The batter should be fluid, like heavy cream; add a little more milk if needed to thin it out. Heat a 6-inch nonstick pan over medium-high heat 2 minutes. Rub the pan with the olive oil using kitchen paper. Pour in 3 tablespoons of the batter and tilt the pan immediately to spread the batter. Cook until golden on the bottom, about 2 minutes; flip and cook until the other side is also golden, about 1 minute. Remove to a plate; continue with the remaining batter. Do not grease the pan again. You will need 12 crêpes (freeze extras up to 1 month). Meanwhile, heat the broth to just below the boiling point. Season with the remaining 1/2 teaspoon of salt. This dish is made, with minor variations, across central and southern Italy, especially for Easter. It is boldly flavored thanks to an abundant handful of grated Pecorino and rendered velvety by the addition of eggs at the last moment. Serve it with roasted potatoes for a splendid main course. Heat the olive oil in a 12-inch sauté pan over a medium-high flame (a terra-cotta pan is ideal, but cast iron or heavy stainless steel will do). When the oil is hot, add half of the lamb and brown it on all sides, turning often to cook evenly; it will take about 8 minutes. Remove to a plate; brown the remaining lamb in the oil left in the pan. Return all the lamb to the pan, add the onion, stir, and cook 5 minutes, or until the onion wilts. Add the wine and cook until it evaporates, about 10 minutes. Cover; lower the heat to medium-low and cook for 1 and 1/2 hours, adding 1/4 cup of the broth every 15 minutes. Uncover; the lamb should be fork-tender (cook a little longer if it is not). 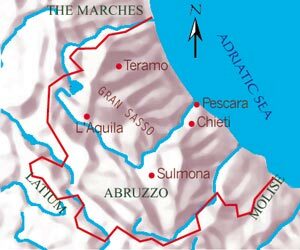 One of Italy's largest producers of wine (it ranked fifth in the mid 1990s), Abruzzo is home to a number of first-class wines. Cerasuolo d'Abruzzo: The region's second most important red; fruity, intense, dry, with a deep cherry color. Controguerra: The red, dry and slightly tannic, is made mostly from Montepulciano, Merlot, and/or Cabernet Sauvignon grapes; the white, fruity and dry with a bitterish aftertaste, is made mostly from Trebbiano Toscano and Passerina grapes, and is vinified both still and frizzante. Montepulciano d'Abruzzo: Abruzzo's most important red, vinified from 85 percent Montepulciano grapes; plummy, velvety, and dry, it ages well and is ideal alongside red meats and aged cheeses. Trebbiano d'Abruzzo: Delicate, dry white wine vinified principally from Bombino Bianco grapes. Whether you enjoy mild, creamy cow's milk cheeses or tangy, firm sheep's milk cheeses, Abruzzo offers something for everyone. Unfortunately, as in most of the less-traveled regions, the most interesting cheeses are only available in Italy; so far, Scamorza is the only one widely sold in North America. Cacio Marcetto ("Little Rotten Cheese"): Pecorino fermented in sheep's milk until tiny flies (still at the larval stage) develop; production is now banned. A similar cheese is found in other regions. Caciofiore Aquilano: Sheep's milk Caciotta coagulated with vegetable rennet obtained from wild cardoons; colored and flavored with saffron. Cacioricotta Abruzzese: Sheep's milk Ricotta; flavored with coffee and lemon zest, eaten on feast days. Caciotta d'Abruzzo: Cow's or sheep's milk cheese; can be young or aged, and is sometimes flavored with chili pepper. Pecorino d'Abruzzo: Sheep's milk cheese, enjoyed as a table cheese or cooked; older specimens can be aged 2 years and are quite pungent. Scamorza: Pear-shaped plastic curd cheese (same family as Mozzarella) made from cow's milk; buttery and delicate, it is meant to be eaten within 3 days of production. The best Scamorza is said to come from the town of Rivisondoli. The smoked version is usually grilled or spit-roasted. Many families in Abruzzo still raise pigs, and every winter the pig slaughter yields succulent hams, salamis, and sausages. Families who don't raise their own pigs stock up on savory cured meats at their favorite salumeria, the Italian equivalent of the delicatessen. All of the cured meats listed below are available only in Italy, since they don't meet FDA regulations; most are made of pork, but some, like the famous salami of Anversa, are made of sheep's meat. Fegato Dolce ("Sweet Liver"): Pork liver in casings; flavored with honey. Fegato Pazzo ("Crazy Liver"): Pork liver in casings; flavored with chili. Fiaschetta Aquilana: Smoked pork salami. Lonza: Sausage from the shoulder and neck of the pig; spiced, salted, and hung to dry, aged for a minimum of 2 months. Called Capocollo elsewhere. Mortadella di Campotosto: Finely ground pork sausage threaded with a wide strip of lard; also called Coglioni di Mulo ("Mule's Balls"). Prosciutto di Basciano: Ham that benefits from the fresh mountain breeze of the Gran Sasso; flavored with chili and aged 1 year. Salame di Pecora: Salami made of sheep's meat; rare except in Anversa degli Abruzzi. Ventricina Vastese: Pork salami spiced with chili and wild fennel; aged at least 3 months. Ventricina Teramana: Spreadable pork sausage similar to the Marches' and Umbria's Ciauscolo; spiced with rosemary and chili. "This one is very unusual," says the waiter as he sets the platter of salami on the table with a flourish. "It’s salame di pecora [sheep’s salami], very typical of Abruzzo." My husband and I are lunching at Rigoletto, a quaint restaurant in the city of Sulmona, with one goal in mind: to try as many traditional Abruzzese dishes as our combined appetites will allow. Owner Celestino Le Donne has already brought out fresh mozzarella, battered and fried zucchini blossoms, and marinated eggplants as part of our antipasto selection. After we polish off the salame di pecora, which is really quite delicate, Celestino emerges from the kitchen carrying his signature dish: ravioli stuffed with Scamorza cheese in a creamy saffron sauce. The waiter refills our wine glasses, gliding away silently, leaving us to marvel over one of the most perfect plates of pasta we have ever savored. Ristorante Rigoletto: Via Stazione Introdacqua 46, Sulmona, 011/39/0864/55529. Chef/owner Celestino Le Donne offers tasty Scamorza Ravioli with Saffron (Ravioli di Scamorza con Zafferano) and organizes a Panarda (50-course feast) every 2 years. Nurzia: Piazza Duomo 74-75, L'Aquila, 011/39/0862/21002. Historical café; buy the moist chocolate nougat the city is famous for. Alberto Il Fornaio: Via Riccitelli 23, Teramo, 011/39/0861/242222. The best bread in town. Cooperativa Altopiano di Navelli: Via Umberto I 17, Civitaretenga, 011/39/0862/959163. Buy Abruzzo's locally grown saffron, the black lentils of Santo Stefano, and other indigenous products here. Garlic Festival: In Torre di Nolfi and Campo di Fano, two villages in the hills above Sulmona, locals grow a red-skinned variety of garlic. Every July, the garlic is used in numerous dishes during a town-wide fest in Campo di Fano. Cascate Rio Verde in Borello: Majestic waterfalls in the mountains. 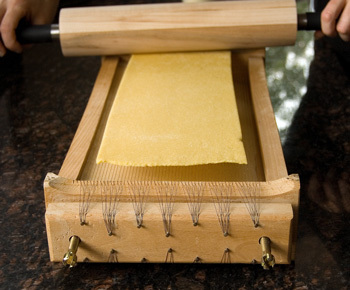 Chitarra: Stringed instrument used to cut pasta; available in houseware stores across the region. 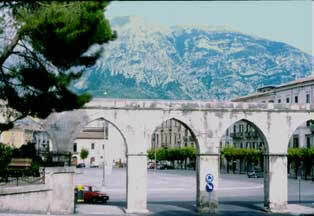 Confetti: Those made in Sulmona are most famous. Fontana delle 99 Cannelle in L'Aquila: Thirteenth-century fountain with 99 spouts. Grilled Scamorza Cheese: Scamorza allo Spiedo in Italian; order it in trattorie. Sheep's Salami: Salame di Pecora in Italian; order it in trattorie, or buy it in salumerie, the Italian equivalent of delicatessens. Skiing in Pescasseroli: The largest town in the Parco Nazionale dell'Abruzzo is a good base for skiing and other winter sports (contact the local ski school at 011/39/0863/91784 to book lessons).